For more than 100 years, United Way of East Central Iowa (UWECI) has been working alongside our funded partners to support, embrace, and improve our community. Throughout this series, we are highlighting our partners in education, financial stability, and health who are truly working to break the cycle of poverty in East Central Iowa. 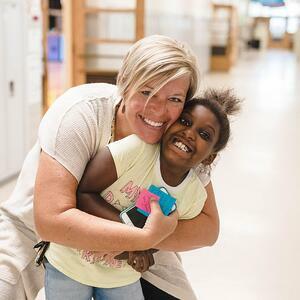 Last month we got an insider’s look at Eastern Iowa Health Center, and this month we’re learning more about Kids on Course, whose mission is to close the opportunity gap, and do whatever it takes to help students achieve their dreams and succeed. The program partners with other organizations in the area to remove any barriers outside of academics that could prevent students from being successful. This could include making sure students have food for the weekend, warm-weather clothing during winter months, or making sure late buses are available so students can participate in programming not only through Kids on Course, but additional activities happening at the schools they serve. Students can get connected to Kids on Course during kindergarten through Page Pals, but the full program starts in first grade. “The younger you start working with an individual, the more impact you can have on their lives,” said Tracey Myers, Executive Director of the Zach Johnson Foundation. Kids on Course helps students improve their reading and math skills from day one, develop strengths and passions through extracurriculars, build time management skills, understand how to navigate difficult social situations, prep for the ACT, plan a path for after high school, and more! Growth and enrichment aren’t limited to the school year, though. Through Kids on Course University, Scholar Camp, and High School Boot Camp, students are able to focus on academics and developing positive relationships year-round. 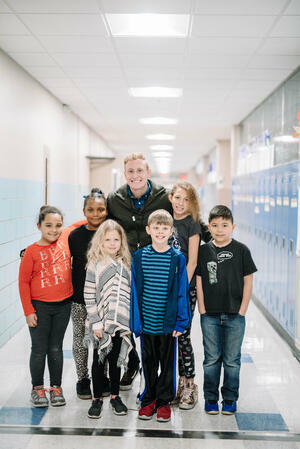 “Hearing the barriers [some of the students] have, sometimes they just need extra support to grow and get to the next level,” said Heidi Brown, Director of Resource Development at the Zach Johnson Foundation. At the end of the day, Kids on Course staff and mentors are dedicated to ensuring students are on a path to leading fulfilling, productive, successful lives. This fall, Kids on Course is expanding its reach to Hoover Elementary.